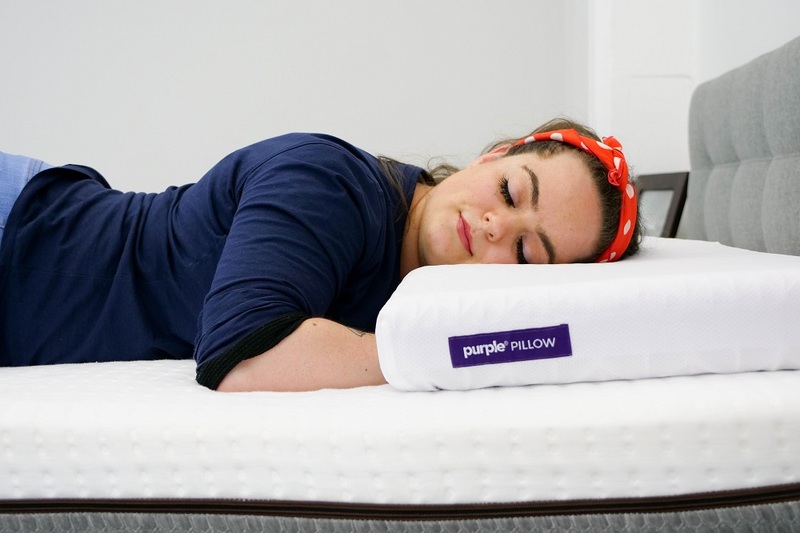 Purple Pillow Review - Relief and Support from a New Material? It all started when a pair of brothers invented a stretchy material called Hyper-Elastic Polymer™ in order to relieve pressure-pain for folks who spend most of their time sitting in wheelchairs. Fast forward a few decades, and those very same brothers took their patented material and applied it to bedding products of all kinds. We now know them as Purple. 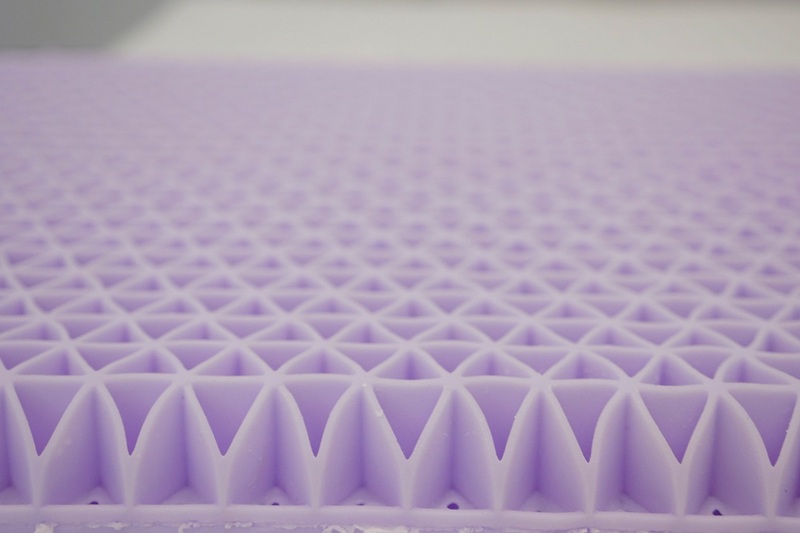 We at Sleepopolis have reviewed Purple’s mattresses, and we know they’re a hit among sleepers. However, I’ll be focusing my review on the Purple Pillow. I’ve never seen a pillow that looks like this, so I’m excited to see what it’s all about! The construction of the Purple pillow is really unlike any I’ve ever seen. Made from the company’s patented Hyper-Elastic Polymer, the pillow’s ‘purple stuff’ is designed to ease under pressure while maintaining comfortable support. 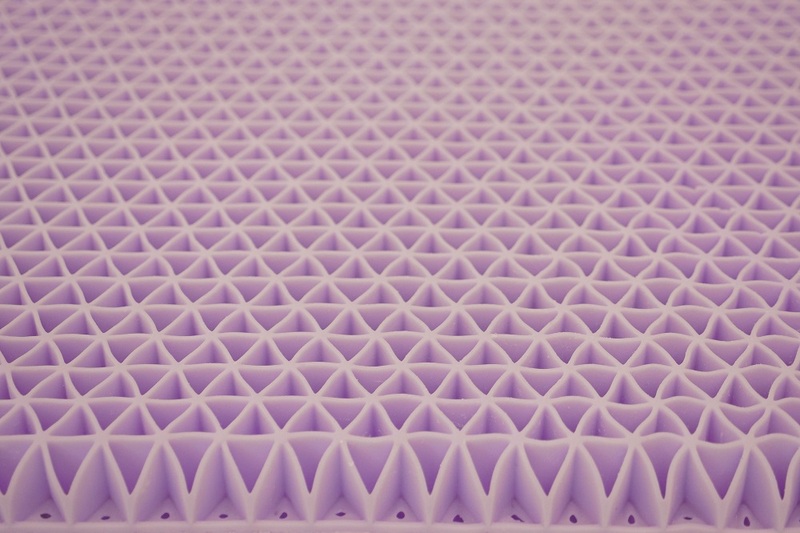 Hundreds of tiny, squishy, purple triangles work together to conform to the sleeper’s head and neck without losing shape or support anywhere else on the pillow’s surface. The pillow’s interior is designed to be firm around the edges and softer in the middle so that any style of sleeper can easily snuggle into the perfect position. The Hyper-Elastic Polymer inside the pillow is arranged in a head-specific pattern that the company refers to as ‘Smart Comfort Grid’. What’s so smart about it? Well, according to the people at Purple, it will never break down or lose shape no matter how often you use it. Not to mention, the grid-like structure provides for great airflow and breathability so that sleepers can enjoy a nice, cool rest. 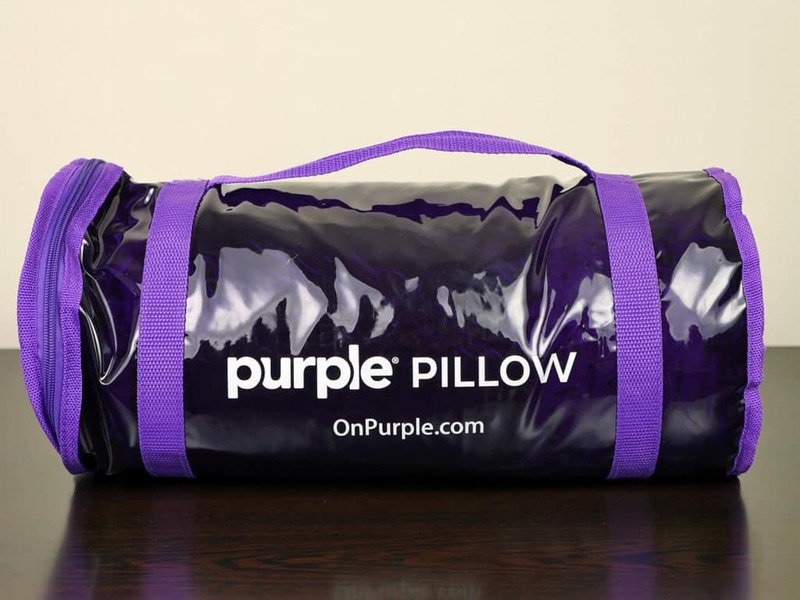 The cover of the Purple Pillow is made from a blend of nylon (92%) and spandex (8%). It’s sort of a semi-sheer white color with a purple zipper that allows for easy access to the pillow’s interior. The cover fabric is actually rather thin, so, while some pillow covers are designed to leave the option of using a pillowcase, I would definitely cover this pillow with a pillowcase. If the idea of a thin pillow cover puts you off, fear not! There is a method to their madness. The light quality of the cover provides for extra breathability to enhance the temperature-neutral nature of the Purple pillow. The cover of the Purple pillow is also 100% machine washable — just be sure to remove the filling first! I have to admit, I was a little apprehensive about this pillow at first. When I unzipped the cylindrical packaging of the Purple Pillow and the slab of Hyper-Elastic Polymer unfolded into my arms, I remember thinking: this is a pillow? It literally weighs ten pounds and moves like jelly — nothing fluffy about it at all. It almost moves with a life of its own; carrying it to the bed, I felt like it was trying to escape from my grasp. However, once I laid it down on the mattress, and laid my head down on the pillow, all was right with the world. My head felt like it was being cradled, yet completely relaxed. My spine felt gently supported as well, and I never felt like my neck was out of alignment. As I said, they fill of the Purple Pillow is not designed to be adjusted. Instead, it conforms to your head and neck, adjusting the pressure relief according to the position you’re sleeping in. I found sleeping on my back to be the most comfortable position as it almost felt like my head was floating, yet softly held in place. Frankly, I was surprised at the level of personalized support this unique material was able to provide. It is often the case with pillows (made of down or polyester, for example) that the edges will have a little less loft than the rest of the pillow, so side sleepers might need to prop or fluff them up a bit in order to achieve a comfortable height. The sides of the Purple pillow, on the other hand, are built to be a bit firmer than the middle. So, if you’re a strict side sleeper, Purple has your back. Another desirable feature of this pillow is that it’s designed to be temperature neutral, employing a breathable grid-shaped interior design that allows for consistent airflow and temperature regulation. You can actually sleep in any position (back, side, stomach, or on your head if you’re so inclined) and the Purple pillow will always adjust itself in order to provide the right level of pressure relief. When you rise, the pillow’s interior just bounces right back into place, ready and waiting for your next slumber. Maybe that’s why they call it smart. MORE: Feel like side sleepers don’t get enough play in the pillow game? Check out our list of the best pillows for side sleepers! WHO WILL LOVE THIS PILLOW? The Purple pillow is definitely distinctive and offers a very different feel from pillows made from memory foam, latex, down, or the other usual suspects. If you’ve enjoyed a Purple mattress, that’s a good indicator that you’ll also like the company’s pillow. However, experienced Purple lovers are not the only sleepers who could benefit from this pillow! Want to try something new – Sleepers who are unsatisfied or bored with fluffing feathers and foam should try the unique feel of Hyper-Elastic Polymer utilized in Purple’s comfort grid system. Want a pillow that is built to last – The nature of Hyper-Elastic Polymer is to never wear down, but Purple includes a 1 year warranty just in case! Switch positions throughout the night – This pillow is designed to meet the needs of every style of sleeper. Back sleepers can enjoy the softer middle of the pillow, side sleepers would benefit from the higher loft of the edges, and stomach sleepers can take their pick. Want a temperature-neutral pillow – ‘Sleeping cool’ is definitely trending, but the Purple pillow offers a temp-neutral pillow with a grid-like interior and breathable cover fabric to allow good airflow. So, it’s not cooling you down — it’s keeping you comfortable. So how do you clean this pillow? Well, this pillow is pretty easy to wash. The cover fabric is completely (and easily) removable and machine washable. The cover does come with wash instructions, but, spoiler alert: you wash it on a warm, gentle cycle with similar colors. As for the interior, it’s 100% waterproof. So just remove it from its cover and wash it with warm water and a gentle detergent. It is worth noting that this pillow has a smell to it, and it’s not like the off-gassing with which we are familiar in foam pillows. 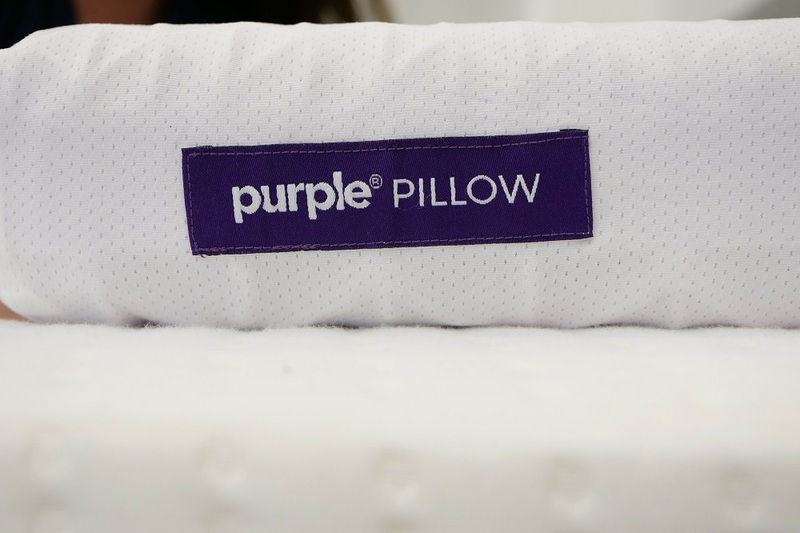 While the Purple pillow’s comfort grid system is made from a non-toxic, food-grade material designed to let air flow freely, it does have a chemical smell. The good news is: the Purple Pillow smell goes away after a few washes and some time to breathe. Another detail to consider when you’re ready to buy Purple’s pillow is that it only comes in one size: 24″ long, 16″ wide, and 3″ tall. So, while it is heavy, it might not match a sleeper’s king- size pillow collection. Shipping – Free shipping to the continental U.S. Yay! Size – The Purple pillow is available in a standard size with dimensions of 24” x 16” x 3”, but weighs in at 10 pounds! Trial and Refund – Purple lets you try the pillow for 100 days, and if you don’t love it, send it on back for a full refund. 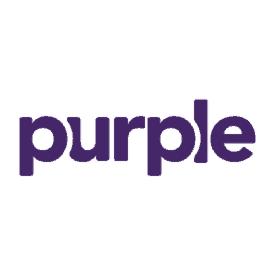 For more information on where to buy the Purple pillow, check it out at over at Purple! The Purple pillow is one of a kind. 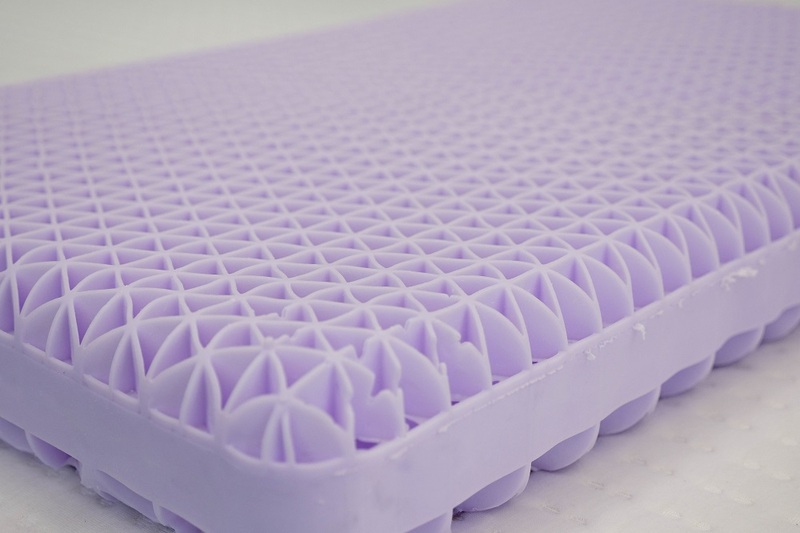 This pillow utilizes Purple’s hyper-elastic, smart grid, polymer material as the core of the pillow. The use of this polymer creates a highly responsive, yet soft feel. Built with a soft center and firmer edges, the Purple pillow is designed to cradle the head while supporting the neck. If you’e in the market for a new pillow and don’t know where to start, the Purple pillow offer a good value for all styles of sleepers.